Thanks to a particularly odious little troll of a man and to a writer whose two major works the late, great Christopher Hitchens describes as “transcendently awful”, the word “tax” has a nearly obscene connotation. Nonetheless, it is clear to me that a carbon tax, similar to those implemented in major economies throughout the world, should be broadly implemented here in the United States – the second largest emitter of carbon dioxide in the world. Well, sure, he’d probably make a lot of money off fleecing middle and lower class citizens. Unlike a lot of mush-minded Greenies, I am under no illusion that a tax on carbon emissions will discourage people from burning carbon-based fuel or will serve just retribution on wasteful capitalists. Nor do I think that the taxing authority will use the collected funds for anything other than a typically idiotic boondoggle. 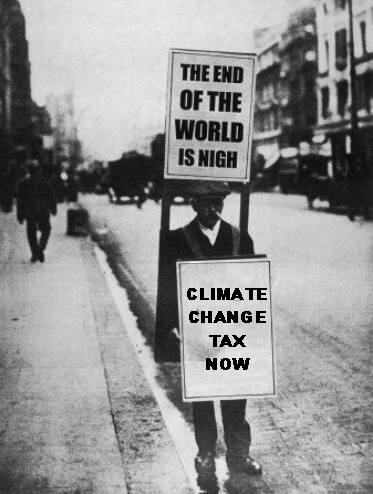 In fact, I do not even believe that a carbon tax will do anything to stop the near-term effects of climate change (there is plenty of heat stored in the ocean, and those chickens will take decades to come home to roost). Not a very convincing argument, eh? No. My reasoning is based completely on free market considerations. Humans do one thing phenomenally well: adapt to obstacles. If there is a mountain in front of us, we’ll climb it, build a tunnel through it, construct a road around it, and throw up a scenic overlook on the side of it. The pure expression of human adaptability is the free market system. Before June 2007, no one even realized that not being able to watch their favorite superhero movie while commuting to work was even an obstacle to overcome. Now, try to take a commuter train or subway (or even an elevator) without taking your smart phone out of your pocket. OK, you’re welcome to read the rest of this silliness, but, let it be noted that it was really the private sector which developed the ability to watch that movie, not government placing taxes on your entire life, jacking up your cost of living to finance the movies and development of the technology. Again, the government passing any type of carbon tax legislation, then setting the terms and pricing while running the whole thing has nothing to do with a free market. It is forcing the market to respond. It is rather what is called Socialism. This entry was written by William Teach and posted on at 3:57 pm and filed under AGW Socialism, Economy, Global Warming. Bookmark the permalink. Follow any comments here with the RSS feed for this post. But were gonna die in 12 years. We should take all 20 trillion dollars in GDP each year for the next 12 years and do whatever is needed to fix global warming. I don’t know what that entails but AOC is so smart and on the ball she can’t possibly be wrong. Instead she wants us all to have universal health care for the next twelve years so we can GO OUT HEALTHY. The word tax not only does but should have a nearly obscene connotation. Taxes taken for absolutely necessary government services are reasonable, but when those services are not necessary, then yes, taxation is inherently obscene. Taxation for police and fire and defense I regard as necessary. Taxes to build and maintain roads is necessary. Taxation for welfare, for the arts, for anything we were able to live without a hundred years ago are not necessary, and should be totally eliminated.